Perfect Pool 3D Game Review - Download and Play Free Version! Take your pool skills to a whole new level by putting a pool table on your computer! Enjoy the realistic physics, 3D pool table and playing against the computer or a friend, all without leaving your desk. Play alone, with a computer on one of three difficulty levels or with a friend via the internet or a network. Try to be the first to knock out 20 balls. While you aim, helpful lines will show where the ball is likely to go if you hit it at that angle. 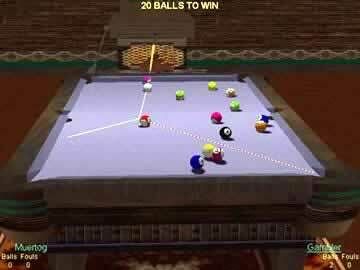 Move around the 3D pool table easily and choose your shot. It's easy to aim and control the cue and the realistic physics make it seem like you're really there! Practicing pool is easy and realistic with this game! Study how the ball moves and practice aiming, then bring those skills to a real pool table and impress everyone. If you don't have a pool table, this game is a great way to still enjoy pool, alone or with a friend. 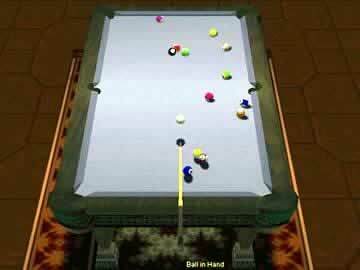 Enjoy a great game of pool now with Perfect Pool 3D! Perfect Pool 3D is a pool game that has both its ups and downs. It does offer decent multiplayer play, as well as computer opponents you can take on at a variety of difficulty levels. There are also hints and help you can make use of in the Practice mode (like seeing the best shot you can take). There are also a few issues to watch out for that bring the game down. The lack of sounds, limited type of gameplay, and other smaller issues mean that you'll likely find a better pool game to play. 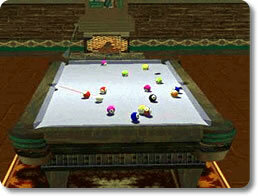 The type of pool you play in Perfect Pool 3D differs from many other pool games. Your goal is simply to pocket as many balls as possible, without fouling (by not hitting a ball or pocketing the cue ball). You want to reach a certain number of balls to win the game (which you can set beforehand). Fouls reduce your number of balls, and can even earn you negative balls. You start by setting up the game. You select whether to play against a human player or the computer, the difficulty level if against a computer, whether it'll be a practice game or not, and the number of balls you need to pocket to win. In this way, you can create a quick game that will only last a few minutes or a much longer game that could go on for hours. One of the biggest drawbacks for the game is the lack of variety. There is only one type of game to play, so you won't get to play other games like 8-ball, American, 9-ball, and more that you can in other pool games. There is also no tutorial of any sorts to teach you the basics, which would help new players. However, the game does let you take on a computer opponent or friend on your computer, and offers a Network Game option as well. A Network Game lets you play against a friend over a Local Area Network or the Internet. There's also a Practice mode, which lets you turn on hints like the best shot you can take or the path of the ball after a shot. One good feature of the game is the inclusion of difficulty levels for computer opponents. You can set the difficulty from dumb to sniper for a computer opponent, which affects how well they play. This lets you adjust the game to something relaxing, or something that will provide a tough challenge. The ability to adjust the difficulty makes this game more suitable for players of all skill levels. The controls in Perfect Pool 3D are fairly simple and straightforward. All controls can easily be referenced quickly via a help menu in the game. You mainly use the mouse to aim and take shots. Other keys and controls let you adjust things such as music, the view, or the cue angle. The one issue when it comes to the controls is adjusting or controlling how powerful your shots are. You take shots by moving the mouse backwards and then forwards to hit the ball. However, this method means that it's difficulty to fine tune how hard you're going to hit the ball. It would have been nice to have some sort of alternative to make it easier to take weaker/low power shots. The graphics in the game aren't all that amazing and won't blow you away. However, they are on par with the visuals in many other similar games in the pool genre. The sound is a bit lacking, with only the sounds of pocketed and bouncing balls to listen to. It leaves the game feeling quiet and a bit empty. Some more noise or music would have really improved the game. Overall, Perfect Pool 3D is a good pool game. There are computer opponents with multiple difficulty levels to take on. You can also face off against friends on your computer, over a LAN, or online. A practice mode lets you get familiar with the game and use some hints. However, it also has its problems as well. The lack of variety in the gameplay or game types is the biggest issue. You'll also have to deal with the lack of sound and more. If you're interested in or a fan of pool you can give this game a try, but you can probably find a better, similar pool game to play.